Handling extreme temperatures with ease! 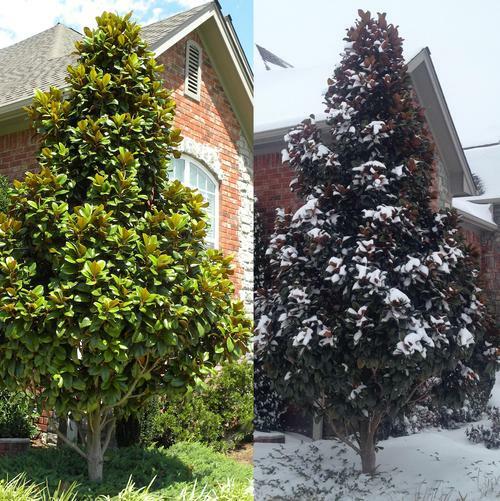 Extreme hot and cold temperatures can be harmful to your plants if the proper care and protection are not in place. When the ground stays frozen for long periods of time a plant’s roots cannot absorb water and nutrients and water within plant cells can freeze causing the plant to weaken, discolor or die. Most of the time newly planted plants are most susceptible to extreme cold weather but care and protection will promote healthy growth for all plants in the landscape. Reduce the amount of watering about a month before cold weather season approaches so that plants have time to prepare for the winter. Make sure to water after a few hard freezes and when the temperature reaches 40 degrees Fahrenheit or higher (never water in colder weather or before or during snow/ice storms). Adding mulch around the base of a plant provides protection in both winter and summer. Adding 2-3 inches of much will protect against severe temperatures and help to withhold moisture around the roots. Burlap or other cloth material can be draped over plants to protect them from snow, sleet, ice, and severe cold temperatures. Make sure the material does not lay directly on top of the plants as this could cause damage. Just as extreme cold can wreak havoc on plants the same is true for extreme hot temperatures. Even drought tolerant plants can be affected by ongoing, extremely hot weather conditions. In extremely hot temperatures plants will do best if they have a uniform amount of water each day and then on occasion a good, long soaking that will go deep into the soil and roots of the plant. This will promote a deeper root system for the plants and better health for the long term. Planting trees and other tall plants that will shade shrubs and flowers will provide protection from the sun during the hot summer months just as burlap or cloth does in the winter.